Two separate cautionable offences in close proximity. It has never happened to me that I have to show a player two yellow cars plus a red card within seconds. How about you? The only situation I remember is with Turkish referee Cüneyt Çakır, but that is a while ago. During the Uefa Champions League game between there is a similar one with referee Felix Brych. Real Madrid player Nacho has the “honour” of receiving two yellows in one minute. Have a look at the video and keep in mind: how does the referee handle it? Below I’ll share my take-aways from this including an explanation about the laws that apply. I always ask you to look at the referee, because it’s very important for you to learn yourself. You can read tips below, but it’s always important you recognize situations yourself as well. 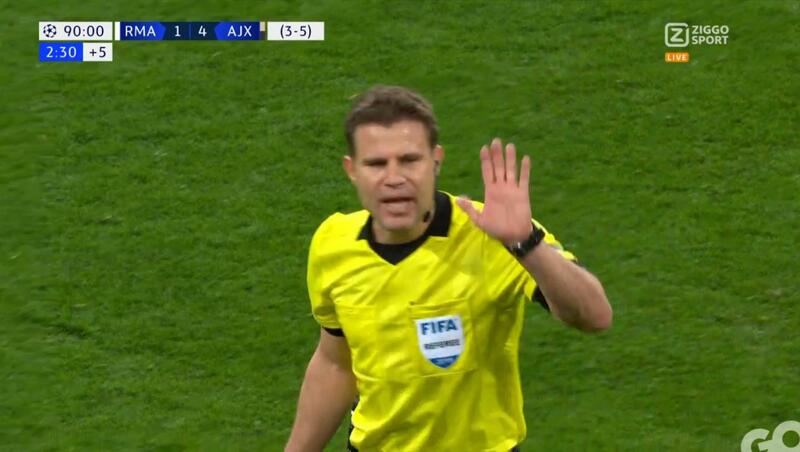 Referee Felix Brych officiates the game between Real Madrid and Ajax in the UCL quarter finals. There is a lot of tension, because Ajax is in the lead in Bernabeu. The clip starts with a cross to the left corner. You might think, why there, but there is a reason I show this long clip. You’ll see Nacho is trying to pass a defender and fails. 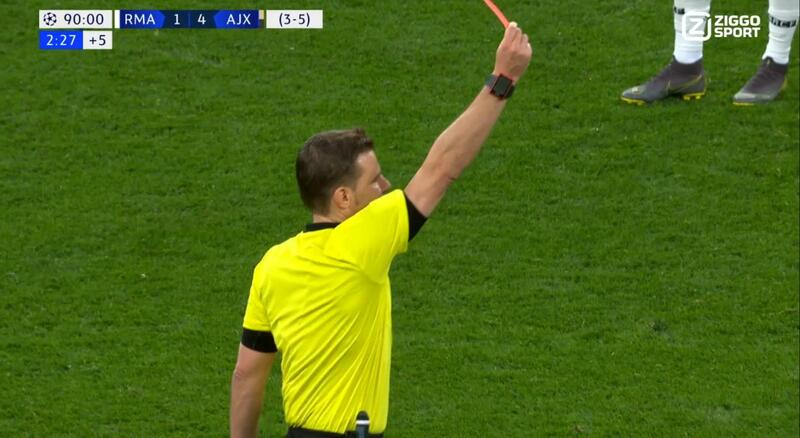 He thinks it is a foul, but the German referee signals that play continues. As a referee you should be alert now. That is when he wants to win the ball back and will put some extra effort in. But not always in the right way. Nacho is sprinting back to his own half and is too late with his tackle. He is not endangering his opponent’s safety in my opinion, but the yellow is correct. You need to show these yellows. These are not calls that decide a game in terms of a goal, but are key in terms of game management. With these tackles, make sure you’re present. Move closer, as Brych does, because fouled players might get frustrated. Here the Ajax defender stays calm and Nacho walks off. All fine then. But unfortunately for Nacho Ajax player Ziyech is there. We can’t hear what they say, but it’s clear that he stops Nacho and probably says something about that tackle. And then Nacho reacts and pushes Ziyech away. What would you have done in this second situation normally? Does it make a difference for you if someone is about to receive another yellow as well? 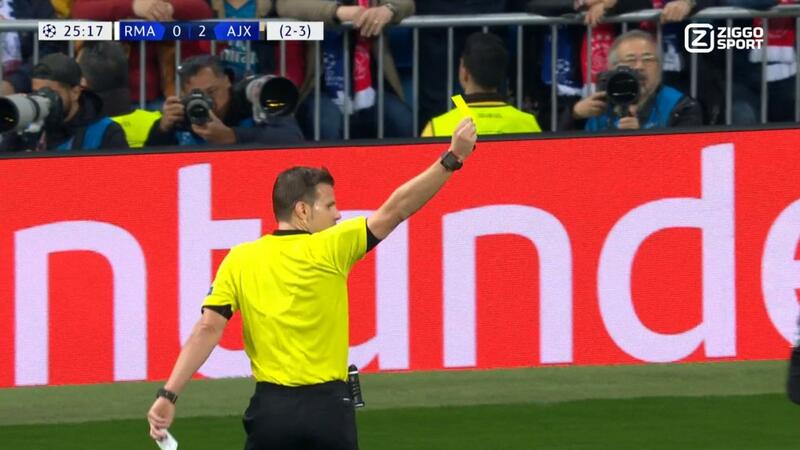 Felix Brych immediately points at Nacho as it was obvious for him that he was the one who caused trouble there. When Brych shows the first yellow card Nacho turns, so he misses the second yellow card. Amongst tv presenters there was also some confusion. 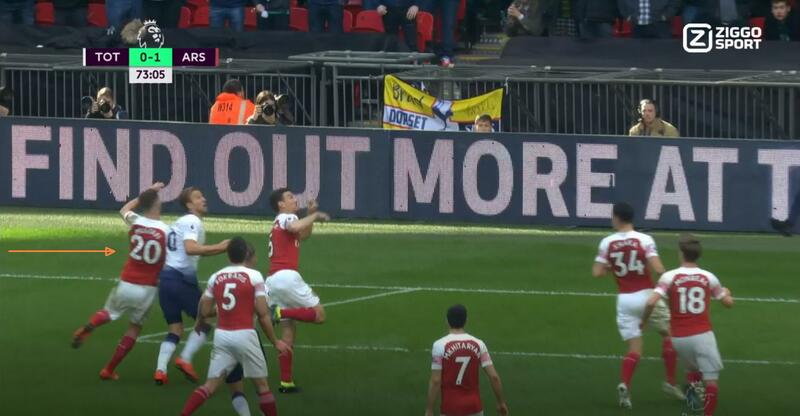 Some even mention that VAR is saying something to the ref. That is not correct. Consequently, Brych shows the cards again and also communicates the reasons. The first one was for the tackle, the second for the push. You can tell it to players, but the whole world is watching on tv. So communicate to the world. Good job there. My takes on this situation. How would you handle this? Referee Anthony Taylor spots foul before offside offence, but is he correct to award a penalty kick? In this case study you’ll learn what to do. Because it’s good to think first, try to ask the following question first. What do the Laws of the Game say about fouls and offside situations? The first question: is Kane in offside position? Because arms and hands of players are not considered, we should look at Kane’s head. 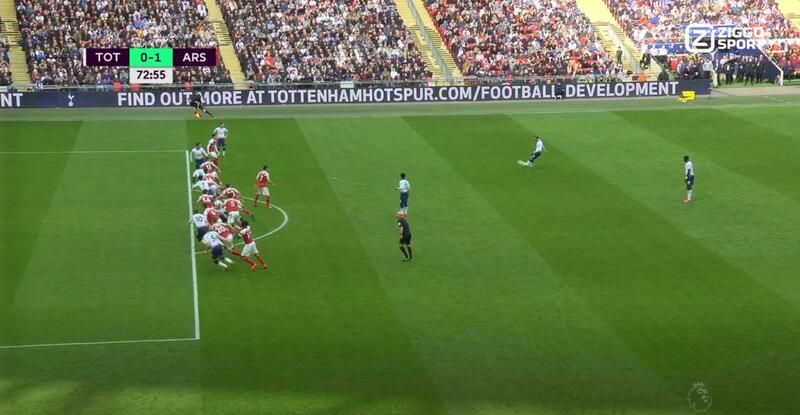 If you look at that on the image, you can see Kane is in offside position. 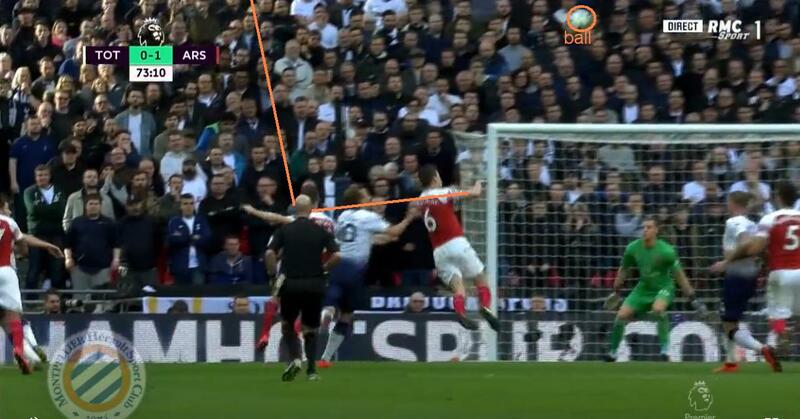 At the moment the ball is still high in the air, Kane is amending is position to head it towards the goal. But it’s Mustafi who bumps into Kane’s back and this push fouls Kane. The Tottenham striker is unable to play the ball. Yes, Kane is moving towards teh ball, but there is no attempt to play the ball. He is also not challenging the defender in front of him. It’s the defender (Mustafi, 20) behind him who fouls him. So the foul is penalised. Correct penalty kick decision. Below you’ll see the referee’s view and a video. There’s also lots of discussion on Twitter whether Kane was challenging Koscielny for the ball or not. Interesting to check for yourself as well. A video of the incident where you see a foul before the offside offence. 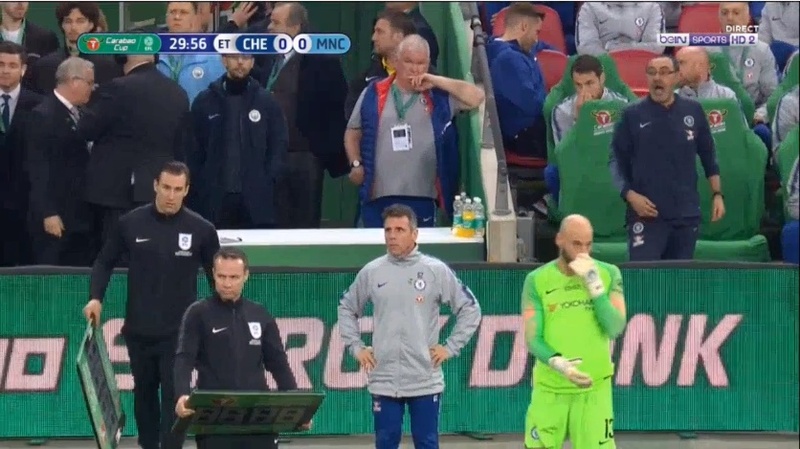 Kepa vs Sarri: case study when a player refuses to leave. I always thought this situation was reserved for my weekly Laws of the Game Quizzes, but it really happened in the Carabao Cup. How do you deal with this situation as a refreee? A unique story in pics and a video, explained by the Laws of the Game. Because Kepa, the Chelsea goalkeeper, was injured, his coach wants to replace him. 4th official Paul Tierney puts the board in the air with number one, but Kepa remains on the field of play. Jon Moss talks with the manager, his assistant and the 4th official and he explains the situation. As a referee, you have no right to force a substitution here. All you can do is continue the game. 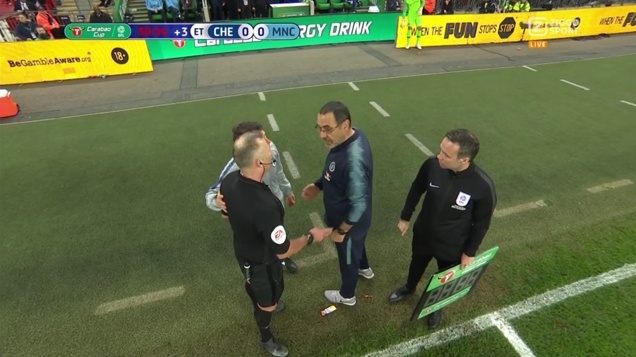 Sarri gets mad, and seems to walk away from the field of play. He comes back, but is not happy at all. In the meantime Willy Cabbalero is waiting, like his nose his bleeding. The person behind Paul Tierney even brings a second substitution board, as it might be needed for additional time. But what if Jon Moss blows the final whistle? Would you allow the substitution to take place? What was your answer to the question above the picture? 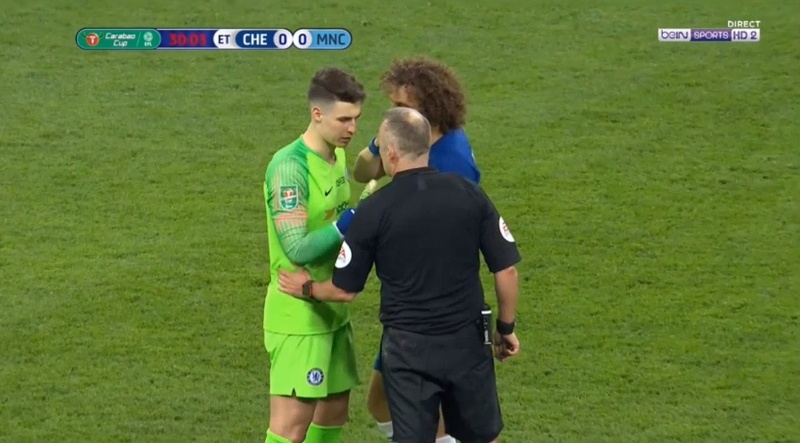 Although Kepa thinks he is not injured, I’d allow the substitution after the final whistle. That is also what Sarri and his assistant manager checked with the 4th official. But in this case Chelsea did not use this option. VAR disallows goal in Champions League. A historical decision, but is it the right one? A case study from a refereeing point of view. It’s a match situation in the game between Ajax and Real Madrid. The referee is Damir Skomina and the video referee is Szymon Marciniak. Want to receive the latest info about refereeing? Subscribe to the newsletter. Check out the highlights of the situation. Below you’ll find the explanation. Because it is so difficult in real-time, you need a VAR to check this moment. De Ligt heads the ball towards the Real Madrid goal. At that moment Dusan Tadic and Nicolás Tagliafico are not in offside position yet, which means that they will not be punished for gaining advantage. Goalkeeper Thibaut Courtois is catching the ball, but is unable to clear it. Nicolás Tagliafico goes to the ball and heads now towards the goal. The moment of that header is key here, because that’s what gives us the right decision. Dusan Tadic is in offside position at the moment of the header. How can someone be in active play? How can someone be in active play when in offside position? Option 1: by interfering with play by playing or touching a ball passed or touched by a team-mate. In this case Dusan Tadic does not touch the ball. Option 2: interfering with an opponent. There is contact between Dusan Tadic and goalkeeper Thibaut Courtois, but is that enough? For me this action has an impact on the goalkeeper’s movements, which makes him unable to play the ball or go to the ball. For me he’s interfering with an opponent, which means the offside call is correct. Scoring directly from a corner kick. Is that allowed? But does the referee need to whistle? 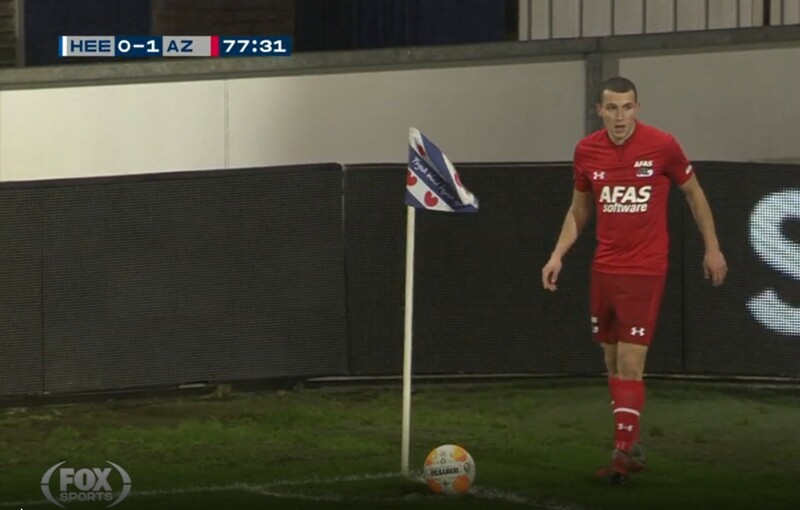 An interesting case study with AZ player Oussama Idrissi. The referee gives no signal to take the corner kick. The Laws of the Game give advice on when you whistle as referee, but a referee does not require it in all situations. Idrissi can take this corner kick, because waiting for a whistle is not mandatory. The AZ goal is legal. There are two other requirements are that the corner flag remains at its place and oponents must remain at least 9.15 m (10 yds) from the corner arc until the ball is in play. All boxes ticked. A wonderful goal that will go around the globe. Watch the video below where Idrissi is scoring directly from a corner kick. It is a great example, because it is a rare situation. Can you score a goal from a throw-in? That was the biggest question this weekend in the Bundesliga game VfB Stuttgart vs Bremen. Goalkeeper Zieler is not alert when a team-mate throws him the ball. But did he touch it? And what if: how do you restart play as referee? A great video example to learn from in this case study. The Laws of the Game are very clear on this. “A goal cannot be scored directly from a throw-in”. Do you know the correct restarts when it happens? Think about this, you’ll get the answers below. Despite this error, all went well for his team VfB Stuttgart. His team won with 2-1. Dissent by action. 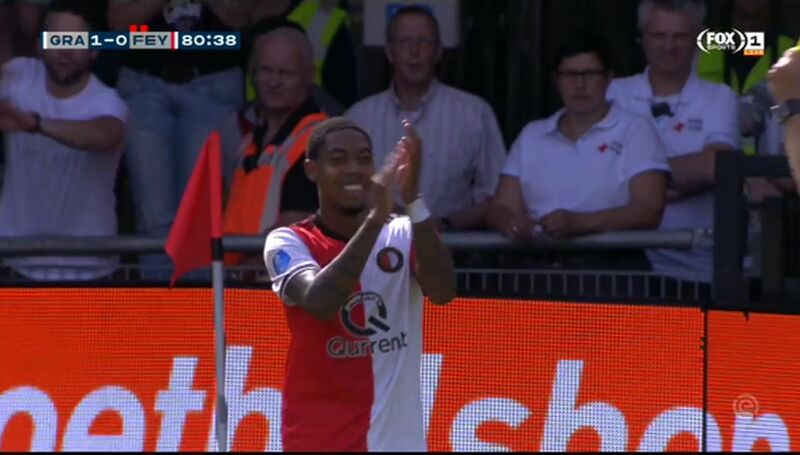 A player applauds after you show him a yellow card. What do you decide? Will you certainly show the second yellow card? Will you give a stern warning, because he’s already on a yellow? Or will you probably ignore him? Jean-Paul Boëtius receives a yellow card by referee Pol van Boekel, but he disagrees. He applauds at the referee’s decision. He receives a second yellow card because of this. But what do the Laws of the Game say about this? Gestures towards the referee result in an indirect free kick. Applauding or other gestures are not the same as ‘offences against a match official’. This type of fouls are physical offences. In the situation below, the restart is certainly not an indirect free kick. It’s a direct free kick, because play was already stopped due to the first physical foul.